2010 アーサー（英語版） 本人（声の出演） "Falafelosophy/The Great Lint Rush"
2011 ザ・シンプソンズ 本人（声の出演） "The Book Job"
2018 ビッグバン★セオリー 本人 "The Comet Polarization"
2018 LUCIFER/ルシファー 神 "Once Upon a Time"
^ 原題 Batman: Whatever Happened to the Caped Crusader? ^ 原題 Superman: Whatever Happened to the Man of Tomorrow? ^ Wagner, Hank; Golden, Christopher; Bissette, Stephen R. (2008). “The Interview”. Prince of Stories: The Many Worlds of Neil Gaiman. New York, New York: St. Martin's Press. pp. 447–449. ISBN 978-0-312-38765-5. ^ Lancaster, James (2005年10月11日). “Everyone has the potential to be great”. The Argus: pp. 10–11. 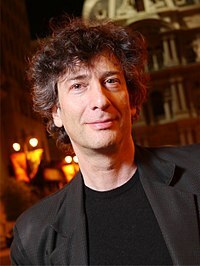 "David Gaiman quote: "It's not me you should be interviewing. It's my son. Neil Gaiman. He's in the New York Times Bestsellers list. Fantasy. He's flavour of the month, very famous"
^ Whitaker, Steve (1989-01). “Neil Gaiman interview”. FA (109): 24–29. ^ Abbey, Cherie D. (ed.) (2010). Biography Today General Series. Omnigraphics Inc.. p. 66. ISBN 978-0-7808-1058-7. ^ a b Campbell, Hayley (2017). The Art of Neil Gaiman (Kindle ed.). Ilex Press. p. 26. ASIN B071FQR3JF. ^ a b Wagner, Hank; Golden, Christopher Golden; Bissette, Stephen R. (2008). Prince of Stories: The Many Worlds of Neil Gaiman (Reprint (Kindle) ed.). St. Martin's Press. p. 3. ASIN B001J3U232. ^ “Head Bars Son of Cult Man”. The Times: p. 2. (1968年8月13日). オリジナルの2013年10月29日時点によるアーカイブ。. https://web.archive.org/web/20131029211637/http://cosmedia.freewinds.be/media/articles/tim130868.html. "A headmaster has refused the son of a scientologist entry to a preparatory school until, he says, the cult "clears its name". The boy, Neil Gaiman, aged 7, (...) Mr. David Gaiman, the father, aged 35, former South Coast businessman, has become in recent weeks a prominent spokesman in Britain for scientology, which has its headquarters at East Grinstead." ^ Olsen, Steven P. (2005). 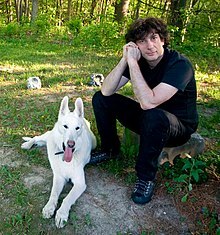 Neil Gaiman (Library of Graphic Novelists). New York, New York: Rosen Publishing. pp. 16–18. ISBN 978-1404202856. https://books.google.com/books?id=Jc9MaZrG3j8C&pg=PA18&dq=gaiman%20-%20moore%20-%20friendship&hl=en&ei=g-cuTfG1DsexhQeA7tHmCg&sa=X&oi=book_result&ct=result&resnum=3&ved=0CDUQ6AEwAg#v=onepage&q&f=false. ^ Irvine, Alex (2008). “Black Orchid”. In Dougall, Alastair. The Vertigo Encyclopedia. London, United Kingdom: Dorling Kindersley. pp. 32–34. ISBN 0-7566-4122-5. OCLC 213309015. ^ Manning, Matthew K.; Dolan, Hannah, ed. (2010). “1980s”. DC Comics Year By Year A Visual Chronicle. London, United Kingdom: Dorling Kindersley. p. 235. ISBN 978-0-7566-6742-9. "Neil Gaiman scripted the complex Black Orchid prestige format limited series in December , re-envisioning the character with the help of artist Dave McKean." ^ Daniels, Les (1995). “The Sandman's Coming: A New Approach to Making Myths”. DC Comics: Sixty Years of the World's Favorite Comic Book Heroes. New York, New York: Bulfinch Press. p. 206. ISBN 0821220764. ^ Levitz, Paul (2010). “The Dark Age 1984–1998”. 75 Years of DC Comics The Art of Modern Mythmaking. Cologne, Germany: Taschen. p. 567. ISBN 9783836519816. ^ Wagner et al. 2008, p.51. ^ Duncan, Randy; Smith, Matthew J. (2013). Icons of the American Comic Book: From Captain America to Wonder Woman, Volume 1. Santa Barbara, California: Greenwood Publishing Group. pp. 741–742. ISBN 978-0313399237. https://books.google.com/books?id=2GNaoeiY51EC&pg=PA741&lpg=PA741&dq=Neil+Gaiman+Jamie+Delano+Swamp+Thing&source=bl&ots=MSdLlzHQES&sig=91GCtO5vivRiJLoKW939oSOU0NA&hl=en&sa=X&ei=NZFqUoKbF5G6yAHX-4GADg&ved=0CD0Q6AEwAzgK#v=onepage&q=Neil%20Gaiman%20Jamie%20Delano%20Swamp%20Thing&f=false. "DC's censorship of Veitch's Swamp Thing #88 (1989) had a lasting negative impact on the series...With Veitch's immediate departure, the team that had been groomed to follow Veitch (writers Neil Gaiman and Jamie Delano) also left the title in solidarity with Veitch." ^ Manning, Matthew K.; Dougall, Alastair, ed. (2014). “1980s”. Batman: A Visual History. London, United Kingdom: Dorling Kindersley. p. 183. ISBN 978-1465424563. "Secret Origins No. 36 Neil Gaiman gave readers a rare glimpse into the inner workings of Poison Ivy's mind." ^ Martin, Brian (2017-08). “Where the Action is...Weekly”. Back Issue! (Raleigh, North Carolina: TwoMorrows Publishing) (98): 77. ^ Manning, Matthew K.; Gilbert, Laura, ed. (2008). “2000s”. Marvel Chronicle A Year by Year History. London, United Kingdom: Dorling Kindersley. p. 317. ISBN 978-0756641238. "Neil Gaiman...took his creative vision and penchant for times past to Marvel, crafting this eight-issue limited series alongside fan-favorite artist Andy Kubert. Digitally painted by Richard Isanove...this series took an alternative look at what the classic Marvel pantheon would be like if they had existed in the 17th century." ^ (英語) Newbery Award Winning Authors. PediaPress. https://books.google.com/books?id=Fm02XvsDssoC&pg=PA201&lpg=PA201&dq=In+1999,+first+printings+of+his+fantasy+novel+Stardust+were+released.&source=bl&ots=pJ2x42ecSD&sig=E5D-TT4vYucGqF-Tw_cazE_luZs&hl=en&sa=X&redir_esc=y#v=onepage&q=%20Stardust&f=false. ^ a b Wagner, Hank; Golden, Christopher; Bissette, Stephen R. (2008). “The Scripts”. Prince of Stories: The Many Worlds of Neil Gaiman. New York, New York: St. Martin's Press. pp. 413–448. ISBN 978-0-312-38765-5. ^ Listen to the "Oral Argument," List of Documents in case: 03-1331 : Gaiman, Neil v. McFarlane, Todd Archived 2008-10-20 at the Wayback Machine.. Retrieved 22 September 2008. ^ See also the official decision by Judge John Shabaz in The United States Court of Appeals For the Seventh Circuit Nos. 03–1331, 03–1461 Archived 2008-12-05 at the Wayback Machine.. Retrieved 22 September 2008. ^ See Judge Shabaz's ruling Archived 2008-12-05 at the Wayback Machine. : "A tentative agreement was reached that... Gaiman would exchange his rights in Medieval Spawn and Cogliostro for McFarlane's rights in another comic book character, Miracleman." ^ Judge Shabaz, Official ruling Archived 2008-12-05 at the Wayback Machine., as per "Schiller & Schmidt, Inc. v. Nordisco Corp., 969 F.2d 410, 413 (7th Cir. 1992)"
^ See Judge Shabaz's ruling Archived 2008-12-05 at the Wayback Machine. for similar statements on Angela and Medieval Spawn. ^ Bleiler, Richard (2011). “Raised by the Dead: The Maturational Gothic of Neil Gaiman's _The Graveyard Book_”. In Olson, Danel. 21st Century Gothic: Great Gothic Novels Since 2000 (1st ed.). Plymouth, UK: Scarecrow Press. pp. 269–278. ISBN 9780810877283. ^ Olson, Danel (2014). “Casket Letters: The Essential Comics of Horror, Gothic, and the Weird for 2014”. The Weird Fiction Review (Lakewood, CO: Centipede Press) 5: 285–291. ^ a b c d e f g h i j k l m n o p q r s t u v w x y z aa ab ac ad ae "Gaiman, Neil" Archived 2013-10-14 at the Wayback Machine.. The Locus Index to SF Awards: Index to Literary Nominees. Locus Publications. Retrieved 5 November 2012. ^ (Carnegie Winner 2010) Archived 2013-01-29 at the Wayback Machine.. Living Archive: Celebrating the Carnegie and Greenaway Winners. CILIP. Retrieved 20 August 2012. ^ "Releases for 2010 Awards" Archived 2012-05-04 at the Wayback Machine.. Press Desk. CILIP. Retrieved 20 August 2012.